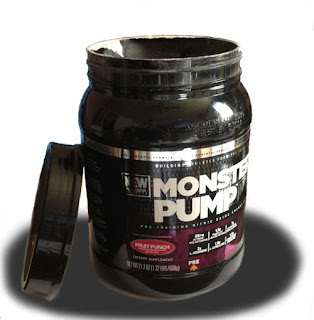 Workout and Bodybuilding Supplement Reviews: Monster Pump Fruit Punch Review - Pre Workout. Monster Pump Fruit Punch by CytoSport is a pre-training (pre workout) Nitric Oxide Energy Catalyst Supplement. I have tried other supplements from the Monster Brand like Monster Milk and Monster Maize and I must say I am disappointed about Monster Pump. I have tried other Nitric Oxide supplements and Monster Pump is so far the weakest. I didn't get to feel that boost on energy like with other pre-workout supplements. Also the flavor is terrible, taste like medicine not like fruit punch and it is almost impossible to make the powder completely dissolve with your bottle shaker. I would not recommend Monster Pump to anybody. Just not the pre-training supplement we all have been waiting for.